Clementines in Chocolate for sale. Buy online at Zingerman's Mail Order. Gourmet Gifts. Food Gifts. A rarely seen specialty from Calabria. The Favella Masseria Ranch is located near Sibari in Southern Italy, which, if you’re up on ancient Greek history, you might recognize as the place where the Sybarites lived and ate famously well. 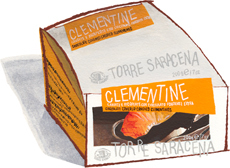 These clementines in chocolate fit right into the Sybarites’ hedonistic tradition: spectacular Calabrian oranges, soaked in a constantly refreshed bath of simple syrup for three weeks, cut in quarters, smothered in dark chocolate. Each piece is the size of a large chocolate truffle. If you slide it in your mouth all at once, the luscious orange syrup won’t drip down your chin. Better yet, be a Sybarite. Let it drip.